Bought this tyre to match the front that came with the bike. Had no previous experience of Continental Motorcycle tyres, but have been really surprised at the performance to price ratio. This tyre can be had for roughly half the price of the current all singing all dancing however it offers a lot more than the budget price suggests. 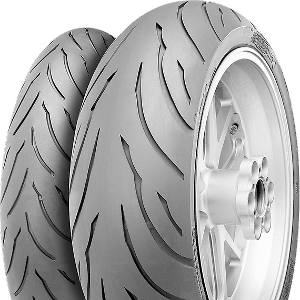 Used on a 600cc bike with nearly 100bhp it performs well and whilst wet weather performance isn't up there with the market leading wet weather tyres it's not far off and whilst the Sunday bike has wet weather star tyres as standard it also has ABS so the older bike with the Conti's doesn't get ridden perhaps as hard in the wet due to this. Well happy and will prob buy again if they also give good mileage. The rear is showing some wear after nearly 2000 miles so expect to need replacing at around 5k, the front seems to wear a bit better but I'm not too heavy on the brakes. so next renewal time will prob need a set. Great tyre, toured in france, spain, england with a pillion and still have more tread. Great grip in the mountains and stable on motorways at and beyond 100mph. Fantastic value for money. Outstanding. I loved the Road Attacks so had to try these. Did a recent trip to Spain and back in all sorts of weather, and got over 5,000 miles out of the rear, despite a huge high speed blast back home - which did prematurely do in the rear (understandable). Much more comfort (sidewall redesign for this tyre definitely works) and better traction and grip than the OEM Bridgestones they replaced. The front looks like it will see of at least one more rear with ease. Yes I bought another Motion for the rear. My pal had a close call on his bike with Motions on, in torrential rain, a car pulled out to overtake right in front of him. He slammed on the anchors, and managed to avoid the car, all with no drama other than a near heart attack - he's a committed Conti Motion convert now too. I wish they did a size to fit the front of my other bike, or they'd be on that as well. I guestimated the likely grip in the snow after positive experience with other Continental tyres, but haven't been though any yet. I ride all the year round, so will find out at some point.